mindbodygreen’s website has more than 10 million unique visitors each month, with about 55 percent of them accessing the site from mobile devices. In early 2015, the company began the process of rebranding, which included an art-directed, image-heavy redesign of its website. About a month after launching the redesign of the mindbodygreen website, Glenister and his team realized the process they were using – which included Amazon CloudFront for serving static images – was going to be unsustainable in the long run because it was so time consuming for the editorial team. “Initially we looked at internal solutions and we tried some libraries that we had used in the past, but those did not meet the needs of our creative team, who had very high specifications and requirements,” he said. They quickly started looking for solutions that would enable them to crop images on the fly, and examining how other image-heavy websites handled their image transformation. This search led them to Gawker’s website, where they dug into the source code and discovered the unique URLs produced by Cloudinary. 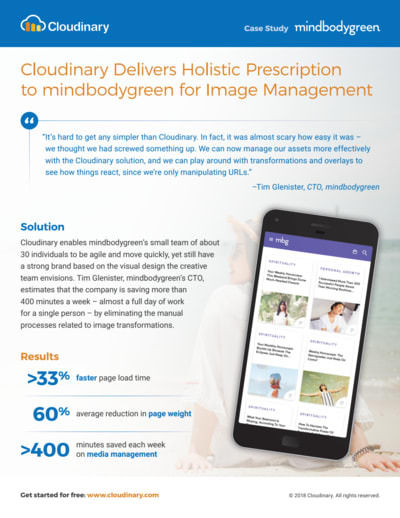 With Cloudinary, mindbodygreen can update the images for its 25,000 articles on-the-fly, optimizing them for any device and any resolution used by visitors. “We are using lazy loading, DPR parameters, and HTML picture tags with polyfill, which enables us to serve retina images to retina devices and standard images to other devices” he said. Glenister added that with Cloudinary, mindbodygreen also can easily conduct A/B tests, in conjunction with Optimize.ly, to see what design works best. “To visually update the site with just code, versus having to change the underlying assets has been huge for the engineering and creative team. It has allowed us test creative concepts in real-time that would not have been possible before” he noted. The time and cost savings related to the move to Cloudinary were almost instantaneous. In just the first month, mindbodygreen was able to drop its image serving costs by 75 percent, while reducing page load by over 33 percent and page weight by 60 percent on average across devices. 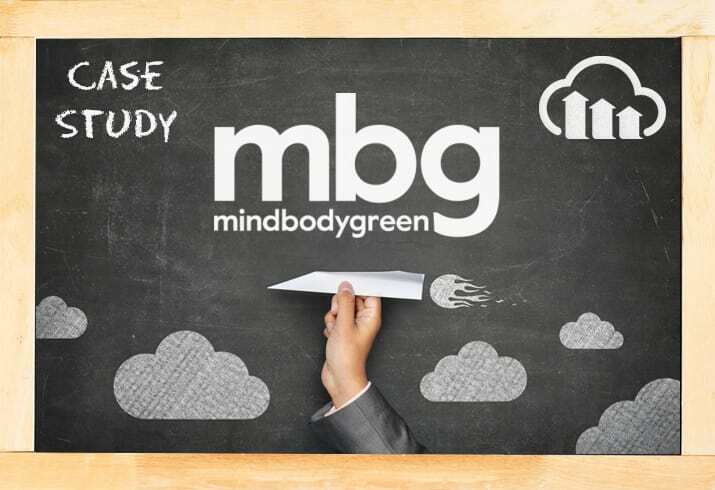 The Cloudinary solution enables mindbodygreen’s small team of about 30 individuals to be agile and move quickly, yet still have a strong brand based on the visual design the creative team envisions. Glenister estimates that the company is saving more than 400 minutes a week – almost a full day of work for a single person – by eliminating the manual processes related to image transformations.